All Steel Boot Knife | BUDK.com - Knives & Swords At The Lowest Prices! Talk about a steal! 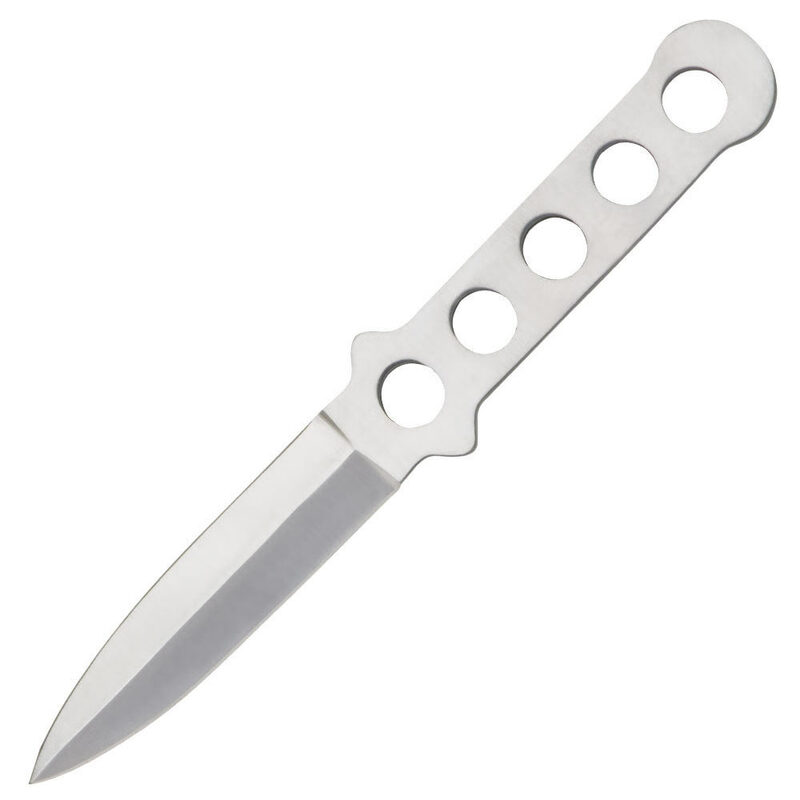 This full tang boot knife is constructed of one solid piece of stainless steel and more than 8" in length! It can be used as a diving knife, throwing knife and more importantly a boot knife! It even includes a leather belt sheath. I have 13 of these knives because they are really good throwing knives. They are a good sized knives and the knives can be held with a good grip if you wish to just swing it at something...or someone. Haha This knife is not stainless steel and will rust!! But... It is still definitely worth it and because of the cheap price of it I give it 5 stars! I swear if these go back down to $3 dollars I'm buying another dozen of them. These are good no spin throwing knives and they have a good size. Also they are double edged and can just be used as a cutting knife too. You may have to sharpen some, also the sheath on all the ones I ordered are very VERY low quality, but hey these are pretty cheap. I bought 1 and really liked it and thought it was good for no spin throwing, then when these went down to $3 each I bought a bunch so now I have 11 good throwing knives. I give these knives 5 stars! because they can be used in different ways and are cheap. It's got a point and a blade very easily to sharpen but the edge does not hold good.I've had mine for 2 1\2 years still together and functional. Does bend so not good for extreme use. For 3.99 its a good knife. Customizability is awsome. Blank slate like douge says. Feels flimsy. Sheath barely a step up from nothing. And that's not even the worst, my biggest problem is it claims good to throw, but doesn't have the balance to do so. I could look past everything but that. It's the reason I ordered it. I purchased this just for the fun of it and for the money I am not complaining however, mine rusted sitting on a shelf in my garage!!! It is NOT stainless steel! I buffed the rust off and cold blued the entire knife so it is usable and has a 'military' look about it. Not the sharpest it could be but I am just throwing it in my fishing tackle box to throw at any large fish I see... if I miss the fish and it sinks to the bottom - who cares... Happy trails. For $3.99, this knife is exactly what you would expect. It is a nice size; double-edged, although it did need a fair amount of sharping; fairly balanced, full tang that would make a great thrower. However, the reason I gave this knife a 2 star rating is because it is incorrectly advertised as stainless steel. Contrary to item description and video, THIS KNIFE IS *NOT* STAINLESS STEEL!!! IT WILL RUST!!! I left mine in the bathroom after a hot shower, and the steam rusted it to the point of ruin. So yes, for $3.99 it is a great buy; JUST DO NOT GET THIS KNIFE WET AS IT IS NOT STAINLESS STEEL!!!! Great piece of steel. Precession made exactly what I was looking for in a knife. Well made very sharp. Best 4 bucks I've ever spent. Nice blade and throws pretty well.